Uses AJAX to dynamically update the add to cart form's color/size dropdown options and text based on current inventory. Please see the image above (enlarged) for functionality. 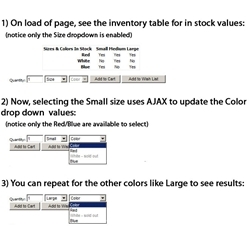 Use this add-on to notify the customer of in-stock color/size combinations based on the Inventory you setup for the product. Using AJAX, this module will update the add to cart form's Color dropdown's text based on the available inventory per customer's Size selection. Reduce your customer's frustration and greatly improve your product page functionality! Like all our add-ons, no source code is required and very easy to install! Response:Yes, it works if only one is active, but its main benefit is with both modifier dropdowns are active; the selection in first modifier drop down updates what is available in the second modifier drop down.